Dunure Castle featured as a footnote in history on a number of occasions during its active life. In 1429 a meeting took place here - presumably because it was seen to be neutral territory - between James Campbell, representing King James I of Scotland and John Mor MacDonald, representing the Lord of the Isles. Violence broke out and MacDonald was killed. James I's efforts to contain the outrage of the Lords of the Isles by executing Campbell did not prevent a subsequent uprising by them. 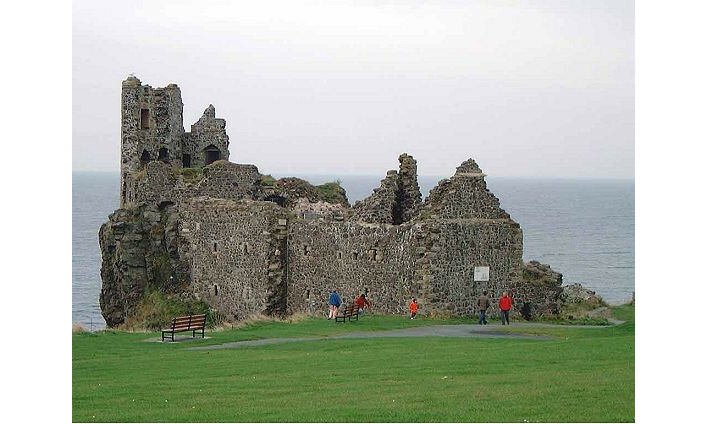 For three days from 4 August 1563, Mary Queen of Scots stayed at Dunure Castle as the guest of Gilbert Kennedy, the 4th Earl of Cassilis. Mary made a number of progressions around her realm during her short reign, and Dunure thus joins a long list of those who would be able to display a Mary slept here plaque. hello...and what a setting right on the beautiful coast..lovely castle if i say so my self!